Check your emails! Samplesource sent out a VIP member offer today to select members! 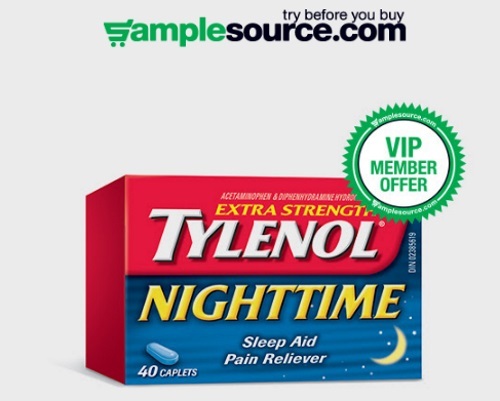 You can try Tylenol Extra Strength Nighttime for Free! Offer is while quantities last. This includes a Free Trial Offer of the product. First ordered and confirmed, first served. Limit one package per address and/or email and/or IP. Duplicate orders will be removed. Product assortment varies by order. Sample should arrive in 4-6 weeks. You can track you order through the confirmation email. Please make sure you click on the link in your email, there is no sign up for this, it would of been sent to your email if you were chosen. The link can only be used once and cannot be shared with anyone. If you didn't get an email, I still suggest logging into your Samplesource account and check if there are any offers for you. Some readers reporting not getting email but still seeing it in their Samplesource account. Click here to learn more about Samplesource. Thanks I got the offer too. You've got to Love Samplesource.